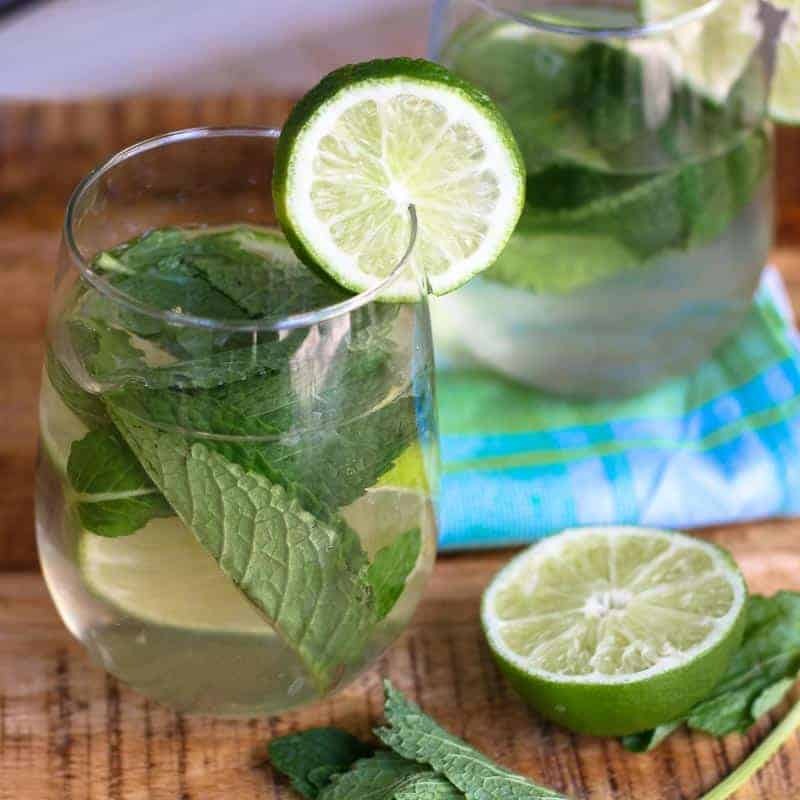 Cool down a hot afternoon with this easy, refreshing White Wine Skinny Mojito Recipe. It is low on carbs, and sugar, but big on taste. If you are watching your waistline, then this is the perfect low calorie wine drink. *This post is sponsored by FitVine Wine. All opinions are my own. Ahhh yes! Spring is approaching… the weather is getting warmer…we are able to step outside again… and all is getting right with the world… except for one thing… BATHING SUIT SEASON! Yikes! It’s that time of year when we have to burn that extra insulated winter fat we put on from staying tucked inside the warm house. I turned 40 this year and this is NO JOKE!!! Love handles have come out of nowhere and rolls have developed in places I didn’t know were possible. What the ???? That obnoxious quote, “A moment on the lips, a lifetime on the hips.” is now becoming my new truth. And I swear the bathing suits get tinier and tinier just when I need more coverage…. I love my wine and food… what’s a girl to do? I will give up a lot of things for health and well-being, but I am sorry; wine isn’t one of them. FORTUNATELY, I came across FitVine Wine. Anyways…. I was actually behaving that night making her and her husband my Spinach Crust Pizza. Jan opened a bottle of FitVine’s Cabernet Sauvignon. We were so impressed. It was full flavored and smooth… Nothing like you would expect for a “healthy” wine. We loved it. I mean, we really loved it. I new at that moment I had to try ALL OF THEIR WINE!!! 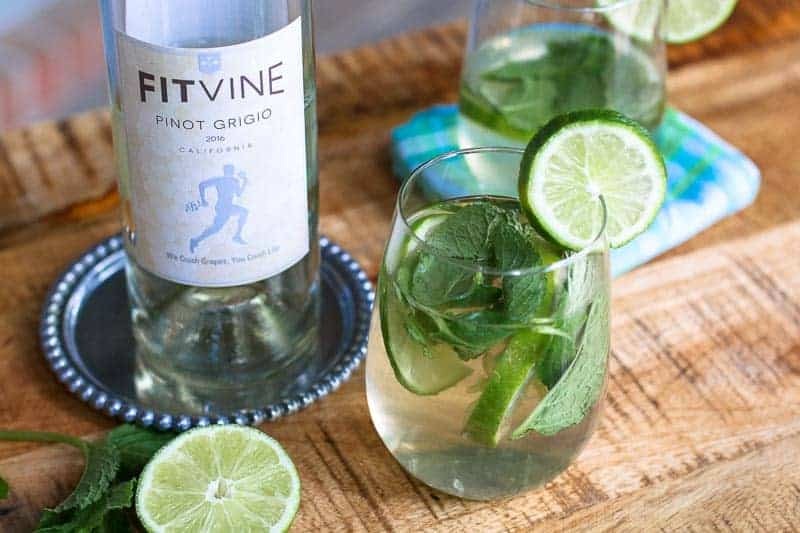 Here is the skinny on the skinny...FitVine wines are doubled filtered with a dry fermenting process yielding higher antioxidants but less of the bad stuff like sugar, carbs, SULFITES, and calories. They are also NON GMO! In other words… a moment on the lips doesn’t mean a lifetime on the hips!! YAY! Therefore, like a crazy stalker, I tracked down FitVine Wines personally and begged to collaborate with them. 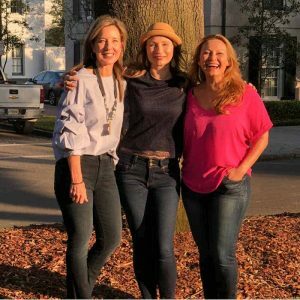 I was like, “If you send me a case, I will share it with all my health-nut, work-out friends, and tell the world about you….” And wonderfully, they did! 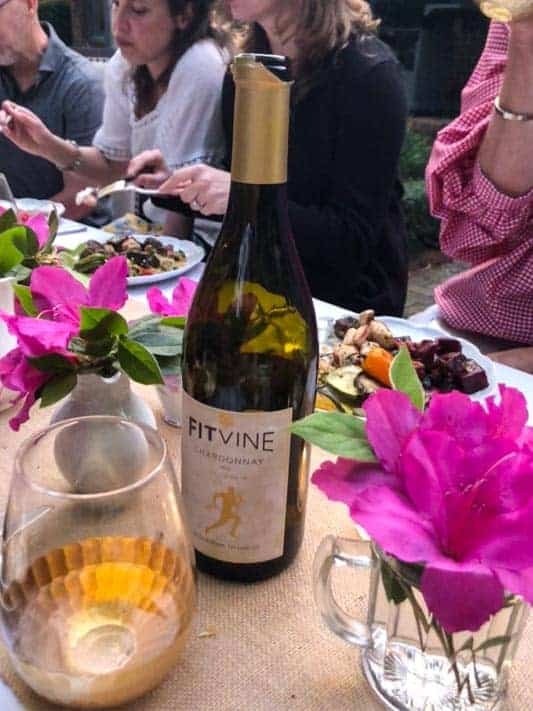 Thanks to FitVine Wine, I became the most awesome friend ever, creating a beautiful healthy Mediterranean Dinner paired with sampling all of the FitVine wine collection. My friends and I enjoyed the wine and food. Their top favorites were Pinot Grigio, Sauvignon Blanc, the Cabernet Sauvignon. 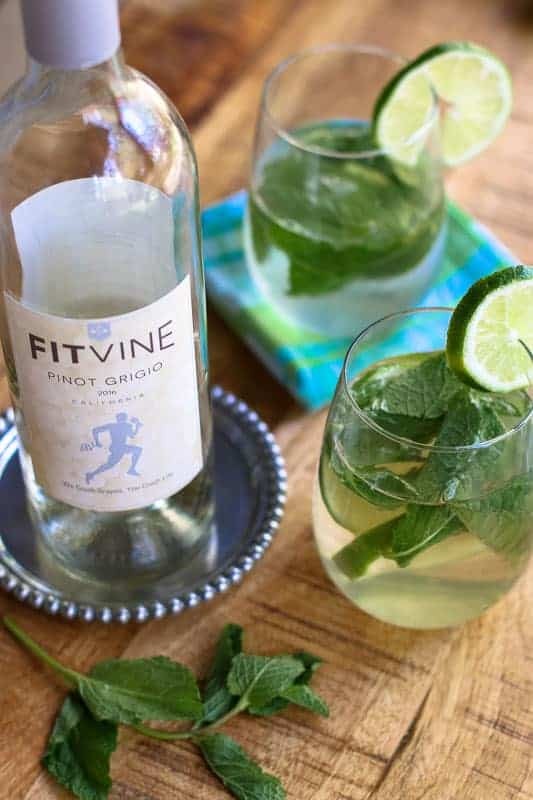 FitVine’s Pinot Grigio is very dry, clean, and crisp. It’s natural hints of citrus and goes beautifully with lime and mint. 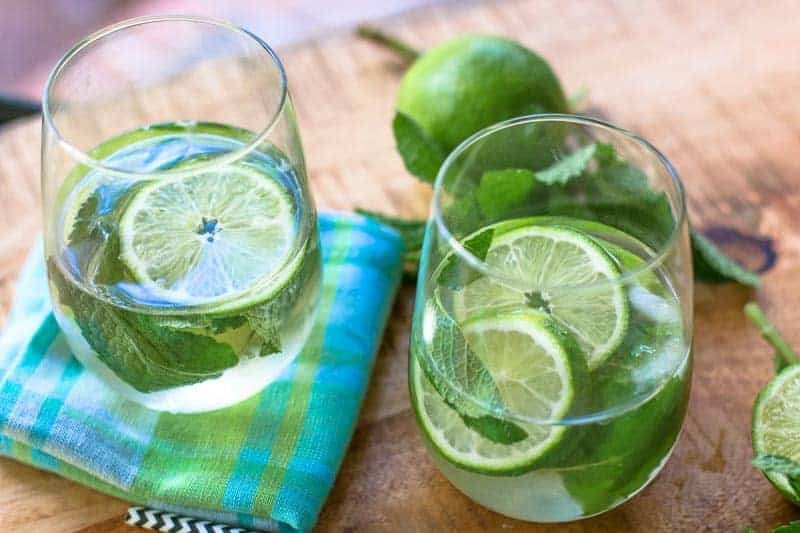 At only 90 calories, .2 grams of sugar, and 3 carbs, this Skinny Mojito is a girls new BFF! 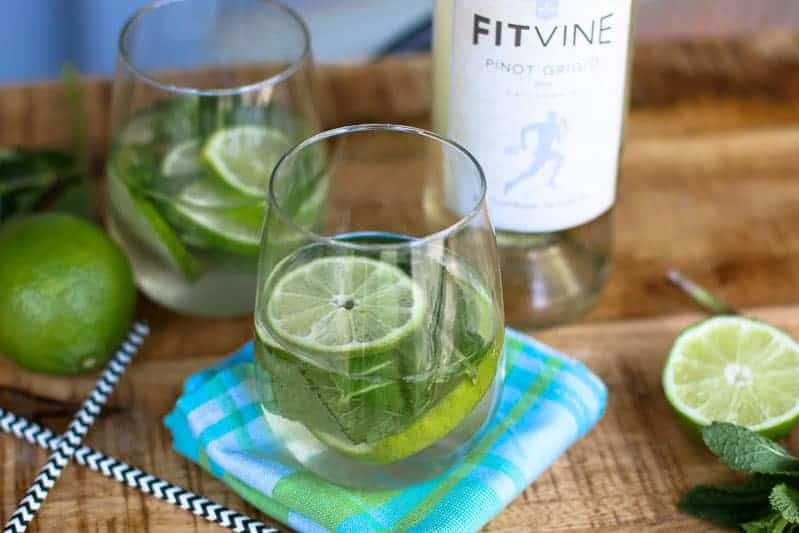 Just chill the wine (Or add ice if you like), muddle a few mint leaves, and squeeze some fresh lime wedges. Out comes a refreshing, light, skinny mojito!! Chill a bottle of Pinot Grigio. Squeeze 2 lime wedges and add remaining ingredients. Serve. To make it sweeter add 1 tsp Agave Nectar or a dash of Stevia. A moment on the lips, a lifetime on the hips, haha so scary when you live by the Mediterranean beaches and spend about 6 months per year in bikini! This white wine mojito will also be my BFF this year, thanks for the tip! I have not heard of fit wine ever before, will check it up and definitely give it a try. Like yourself, I like my food and my wine so this is great ? thank you for sharing this Katie. I am beyond flattered to be mentioned in this beautiful blog post Katie ! You make me a better person in so many ways ! And such an extra bonus for me – making wonderful memories with you thru delicious foods , wines , drinks – either in your gorgeous home or on road trip to an incredible restaurant or a local favorite hole in the wall. Cheers to you my sweet friend – love you more than sweets & bacon ! ?? ?